Now that a power-sharing deal has been done, these are the most urgent tasks for the new government. After six months of political wrangling, intensive negotiations, and international mediation, Afghanistan at last has a president-elect, Dr. Ashraf Ghani, and a new Chief Executive Officer (equivalent to a prime minister), who is to be nominated by Dr. Abdullah Abdullah. The two men will lead the new government with a sharing of power and decision making over national issues. The new Afghan government is inheriting a stagnant economy and an empty treasury with a society divided along ethnic and political lines. The new president will face an enormous task uniting the Afghan people and rallying them behind a new vision and program for Afghanistan. 1. Sign the Bilateral Security Agreement (BSA) with the United States and the NATO Status of Force Agreement (SOFA). Both presidential candidates pledged during the campaign that they would sign the Bilateral Security Agreement (BSA) and the NATO SOFA within the first few weeks of taking office. These two agreements are vital for the long-term sustainability and professionalization of the Afghan National Security Forces (ANSF). Under the agreements, the United States and other NATO members will provide mentoring, training and equipment to the Afghan forces to counter domestic and regional threats. Signing the agreements will signal to the Taliban, al-Qaeda and the region that Afghanistan will not be left alone and that Western powers are there to stay. The agreements will also have spillover effects in the form of contracts and other economic incentives to local businessmen who have been supplying U.S./NATO forces for the past decade. 2. Address the deteriorating security situation and surging narcotics trade. Ghani has promised to establish a new military council under his direct chairmanship to monitor and coordinate on a daily basis security developments in Afghanistan. Since the presidential election Taliban attacks have intensified and ANSF casualties have surged alarmingly. This year the Taliban have also been able to wage coordinated attacks. This is a serious concern and requires the immediate attention of the incoming commander in chief. 3. Revive a stagnant economy, fight corruption, and keep the foreign aid flowing. The Afghan economy has stalled and without action could even contract this year. The new Afghan president and his economic team will need to begin an intense dialogue with Western donors to convince them to frontload some of their commitment in order to allow the Afghan economy to avoid a crisis. The administration will need to make certain commitments to the donor community to fight corruption, reform institutions, and strengthen the rule of law. The president should also combine the dozens of economic policy prescriptions and plans into a single economic document that sets the agenda for the economic development and growth of Afghanistan. Afghanistan is ranked third in the Transparency International’s corruption perception index (CPI). Corruption is a major obstacle to doing business and to economic development. Ghani and Abdullah have a huge task ahead of them addressing this menace, which will require the political will to go after allies. 4. Unite a divided population. The presidential election divided the population along ethnic, political and party lines. Many Afghans feel disenfranchised. Both Ghani and Abdullah will have to present a single political and economic program and vision for the people of Afghanistan and rally them behind this new vision to overcome their differences. The single most important task of the new leadership will be to unite Afghans on a single platform and push for long overdue political and economic reforms. If ethnic and party politics becomes an instrument by which elements of the new government seek to win support then the future of Afghanistan will be grim indeed. 5. Renew regional and global diplomacy. President Hamid Karzai’s confrontational approach and diplomatic quarrels with the United States and the West, combined with a war of rhetoric with Pakistan, has cost Afghanistan goodwill in the West and in the region. The new president will have to earn new goodwill by reviving the spirit of the various strategic partnership agreements that Afghanistan signed with its Western allies and its neighbors, including India, and exploiting opportunities for economic and security cooperation in those agreements. In addition, Afghanistan should either revive the Kabul Declaration on Good-Neighborly Relations or explore a new mechanism to bring a unity of purpose and align the interests of the region with binding commitments. All of this requires will require extensive travel, diplomatic teams, and resources both in Kabul and in diplomatic missions around the world, as well as people with the competence to manage such delicate and important relationships. 6. Reform the judiciary and rule of law. One of the most underdeveloped, underinvested and neglected sectors during Karzai’s tenure has been the Afghan judiciary. It is one of the most corrupt, incompetent and fragile sectors of the Afghan government. Karzai lacked the political will to undertake crucial reforms in this sector because he was afraid to lose allies through a rigorous implementation of law or to fire judges who were key allies and appointees of the former jihadi leaders who constituted the pillars of his government. The problems with the judiciary have pushed people to seek justice in insecure provinces from the Taliban, which offers a clean, swift and efficient system of local justice delivery at the subnational level. Reforming this key sector should be near the top of the agenda for the new president. 7. Call for a loya jirga to amend the Constitution. 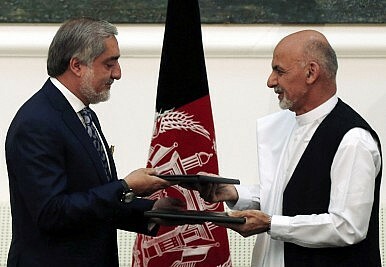 The agreement of the national unity government clearly states that within two years of taking over the office; the new Afghan president shall convene a loya jirga and explore the creation of the office of executive prime minister. Meanwhile, president-elect Ghani promised his supporters on the campaign trail that he would change certain other portions of the Afghan Constitution, for example increasing the number of vice presidents from two to four and increasing the power of the provincial and district governors. 8. Reform the banking and financial sectors. The Kabul Bank crisis and the near blacklisting of the Afghan banking and financial sector due to the delayed approval of the money laundering law now combine with the imminent failure of the Afghan economy. Kabul Bank is still a major obstacle and hasn’t become profitable, and there are signs of problems pm the balance sheets of other major Afghan banks. The reform and strengthening of the Afghan banking and financial sector should be high on the government’s to-do list. Strong, clear steps to reform and strengthen the Afghan Central Bank (DAB), Afghan commercial banks, and other financial institutions will help to restore the credibility of the Afghan banking and financial sector at the international level. 9. Comprehensively reform the civil service. Afghanistan has a pool of young professionals who could potentially form a competent, unbiased and professional civil service. As mentioned in the national unity government agreement signed between the two candidates, the corrupt Afghanistan Civil Service Reform Commission (ACSRF) is in dire need of review and reform. This will strengthen the Afghan state and introduce much needed energy and potential to the new Afghan government. 10. Write a new chapter with the Islamic and Arab worlds. In his first days in office, Karzai alienated the Islamic and Arab worlds, partly because of his overreliance on his Western allies and partly because he blamed them for supporting the Taliban. He later realized this error and tried his best to rectify it, but made little progress. The incoming Afghan president now has the opportunity to write a new chapter in Afghanistan’s relations with the Arab and Islamic worlds. Tamim Asey is a fellow at Asia Society and a Fulbright scholar at Columbia University pursuing a degree in economic policy management. He was also a former Government of Afghanistan official and taught at the American University of Afghanistan (AUAF). Afghanistan's presidential race heats up amid peace talks with Taliban insurgents.